Girl Scout Junior Troop 2638, of San Juan Capistrano, was very excited to visit CHOC to deliver posters and a donation check to support the needs of the children at the Children’s Hospital. The troop, made up of 15 girls, made the decision as a troop as to which organizations some of their Cookie Sale Profit would be directed to. Junior Scout Jaimie Skye Gale, knowledgeable of CHOC’s purpose, shared how the hospital helped youth while hospitalized. Since the girls expressed a strong desire to help other young people in need, the troop voted to donate to CHOC. Some of the troop were fortunate to be able to visit the hospital’s foundation office, ring the bell, display their posters, and enjoyed a visit to the hospital where they learned about patients’ experiences. 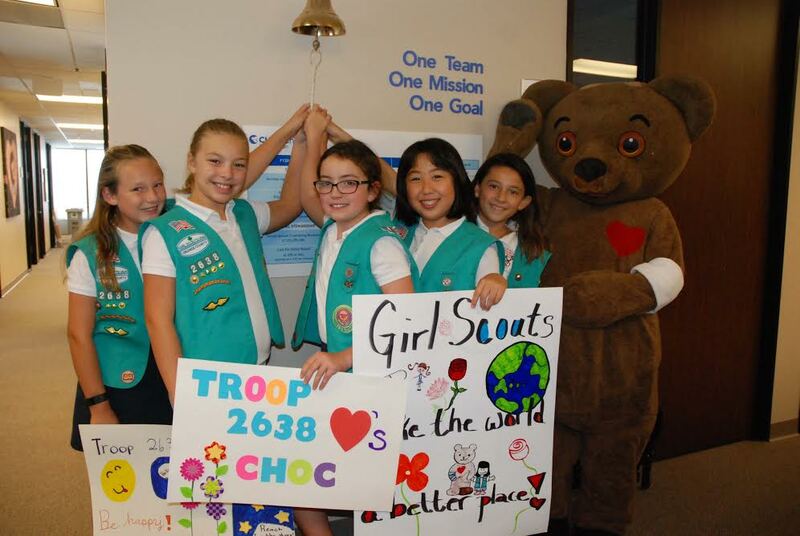 Troop 2638 looks forward to more philanthropic opportunities to help CHOC Children’s fulfill their mission.